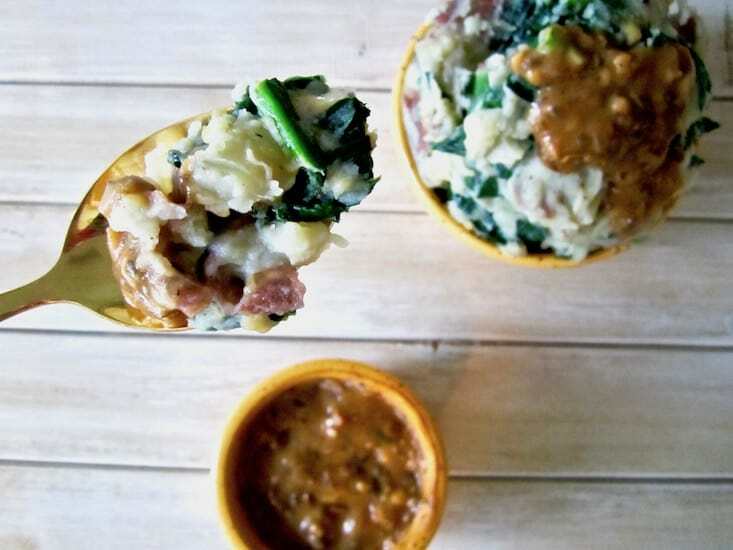 It doesn’t get much more traditional than mashed potatoes and gravy! 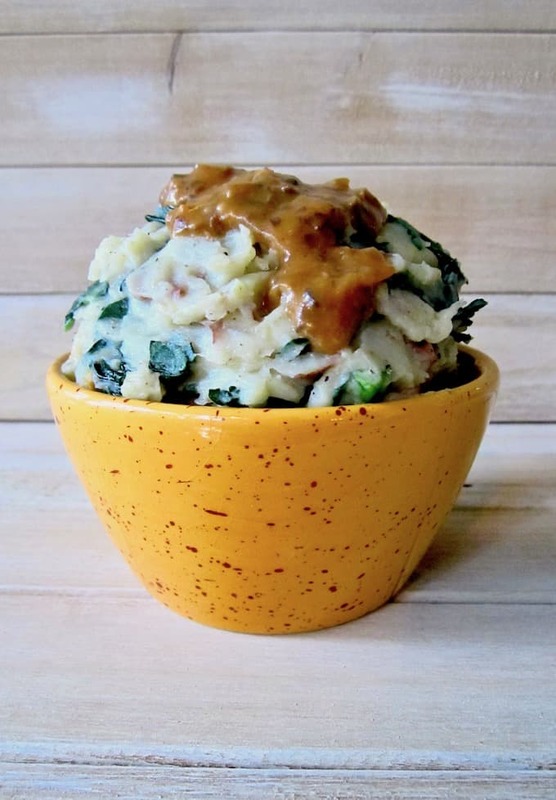 Whether you’re looking for a classic recipe for Thanksgiving or Christmas, or simply want some comforting potatoes and gravy to satisfy you on these chilly nights, you’re sure to love this recipe. Before getting into the details of this recipe, I want to share with you a really awesome resource I just discovered that I know you will love if you’re not already aware of it! I was recently introduced to Karen Broussard, the founder of both the GlutenFreeTravelSite and the Dine Gluten Free mobile app (FREE for iOS and Android)! 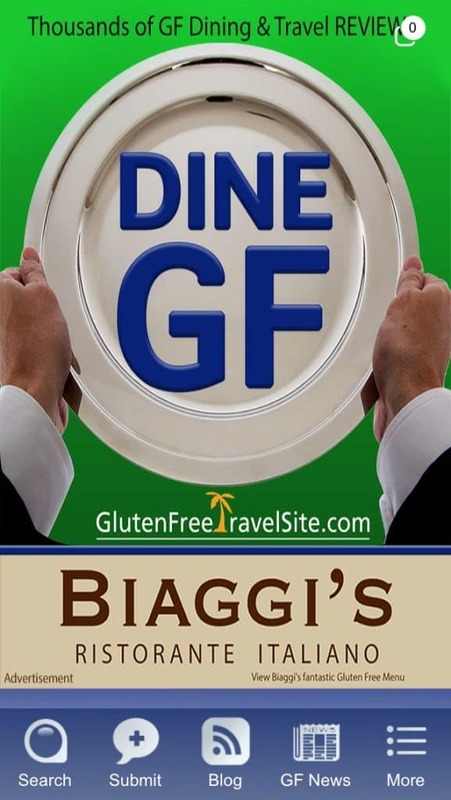 Using the app you can easily search their thousands of gluten free dining and travel reviews from all over the world, and the GlutenFreeTravelSite has TONS of resources for living and traveling with a GF lifestyle. I know many of you who visit this site are gluten free, and this app will support you in finding places local to you, or whenever you travel. 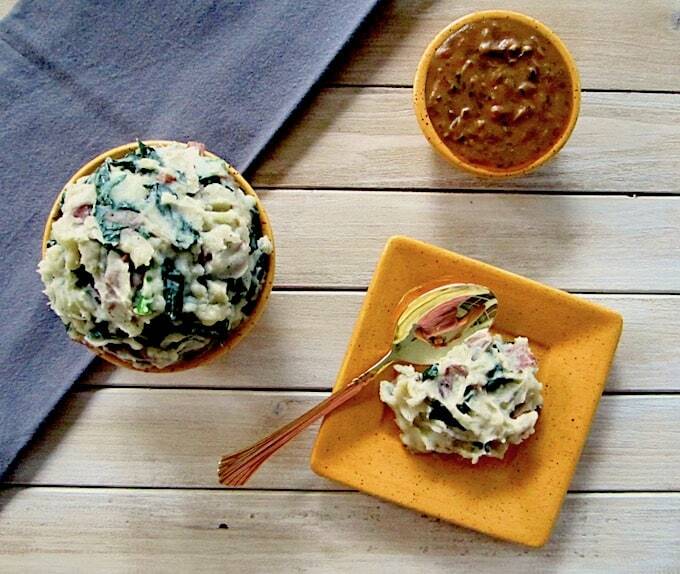 This fresh take on classic mashed potatoes uses thick, canned coconut milk for creamy potatoes. No butter or dairy needed! It’s easy to double, triple, quadruple, etc. this recipe for a big holiday feast! The gravy is OMG good. This is definitely my all time favorite gravy recipe! Thick and flavorful, it’s almost like a rich mushroom soup. You can blend it all the way if you like a totally smooth gravy, or leave it a little chunky with pieces of mushroom and onion (that’s how I like it). I REALLY wish I knew where these recipes came from. I wrote it down 4 years ago from some website but didn’t capture the source (I’ve slightly tweaked a couple parts of both recipes). I would love to give credit to whoever came up with this so please let me know if you’ve seen it before! 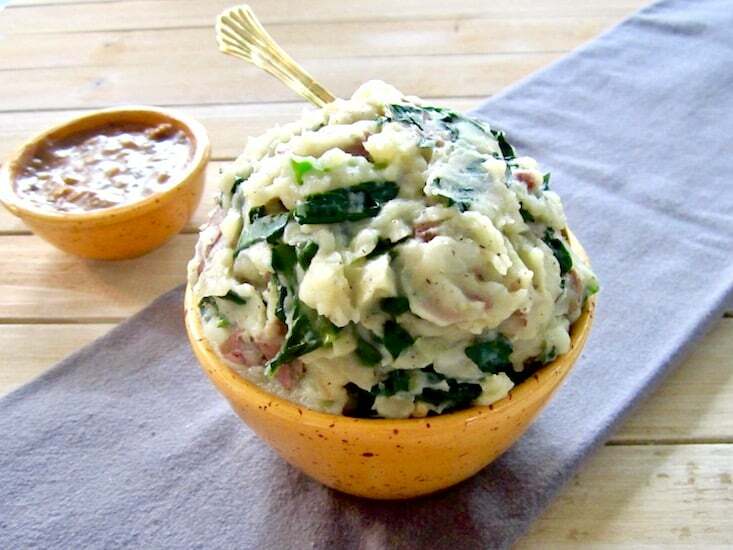 MASHED POTATOES: Add potatoes to a pot of boiling water and boil until tender, about 15 - 20 minutes. Heat 2 Tbsp olive oil in a pan. Add shallots and garlic and saute until soft and slightly browned. Finely chop the kale into small pieces. Add to the pan with the shallots and cook for only a couple minutes. You want the kale to be bright green and not overcooked. 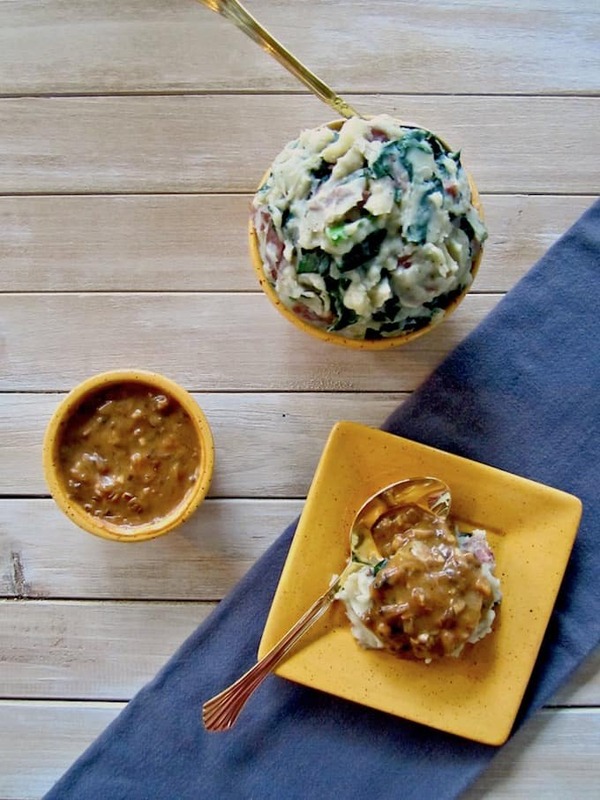 Using a hand masher or stand mixer, mash potatoes. Add coconut milk, the remaining 2 Tbsp olive oil, salt and pepper. If you want a creamier consistency, add more coconut milk slowly. Gently stir in the kale/shallots mixture with a spoon. GRAVY: Heat 2 Tbsp olive oil. 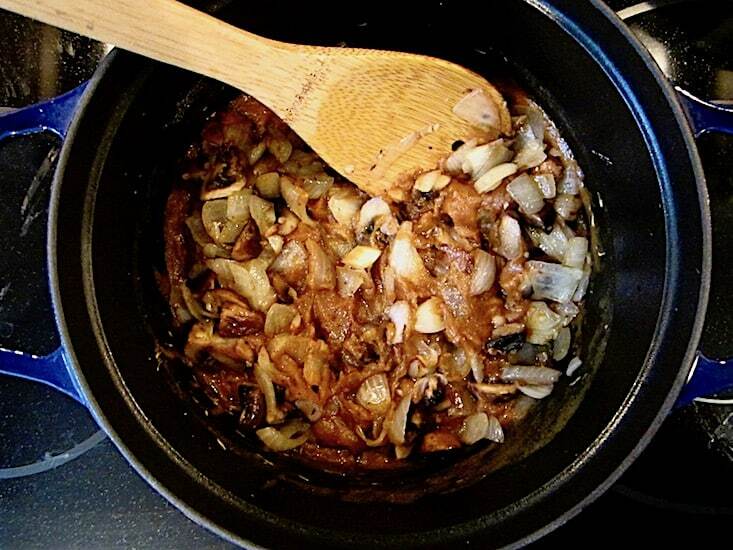 Add mushrooms, onions and garlic to the hot pan. Cook until mushrooms are soft and onions are translucent. In a separate pan, add remaining 3 Tbsp olive oil, brown rice flour, tamari, water, herbs and pepper. Bring to boil and whisk until the gravy is thick (about 10 minutes). Add gravy to the mushroom/onion/garlic mixture. Put mixture into a blender and blend until desired consistency (I like mine just a little chunky and thick). If you like a thinner gravy, add more water a little bit at a time until you reach your desired consistency.